Hello there! I’ve been a little quiet this weekend because I’ve been down in Leeds for Becky’s birthday, but just before I left I got a nice little surprise through the post. Remember the Nelly shoes launch party last month? Well my shoes arrived on Friday! Now I’d opted for the Kim shoes in fuchsia but as you can see in my last post I was doubting myself and wishing that I had ordered the mint green Jade shoes. And guess which ones they sent me? Some clever PR must have read my mind! Or maybe my blog..
I’m so pleased they did though because they’re so much more versatile than the fuchsia Kim’s would have been! Plus they have quite a nice sized heel (just under 4 inches) which means they work as both day and night time shoes. I’ve also noticed they go extremely well with my new trousers that I’ve had on today.. I picked them up in Primark this weekend in Leeds but I’m still a little confused about how I feel about them. You can’t really see from the photo but they’re a lush shape pyjama style black trousers with a floral print. For a while now I’ve admired pj style trousers on others and yes they do have the comfort appeal, but I never really pictured myself in a pair. Then when I spotted these reduced to £7, I couldn’t resist. And don’t they look cute with my new shoes? P.s If you’re wondering about the blister on my foot, I am living proof right now of how dangerous a pair a GHD’s can be (if you stand on them). Omg I am I love with those shoes! 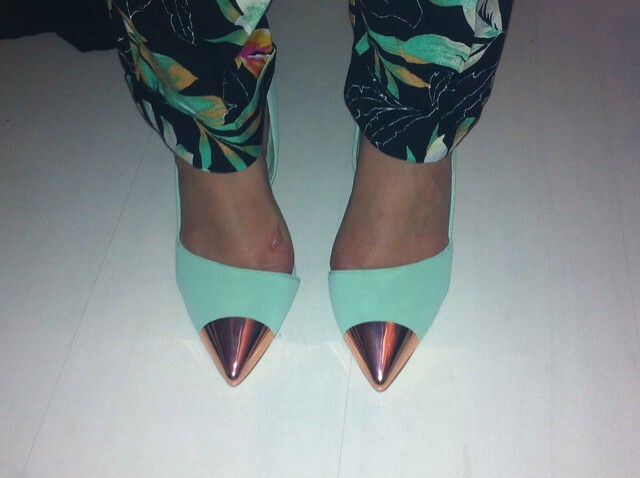 They are so incredibly on trend with their mint hue and metal toe: and they look fabulous on you too. I agree, I think I would like this mint ones better than fuschia too. those are very pretty heels! and that outfit is very cute I love the color. I haven't tried the capped heel trend but think I might buy some. Cute outfit! Really suits the shoes. I've stepped on my hair straightener before – I feel your pain!! Those shoes are gorgeous and I love the colour – it's my favourite! those shoes are SOOOO cute! LOVE IT! I love the new shoes! Really nice shoes! Lucky you! I like the trousers, wear them with confidence haha. UMMM wow! Totally in love with those shoes 🙂 🙂 🙂 You look gorgeous in them!